If you are a homeschooling family like we are, chances are you know the stress that comes with making the decision to homeschool. I worried about not being smart enough to teach my kids, social awkwardness (for me and them) and especially money. Money always seems to be an issue no matter what leaps you want to take in life. It also shouldn’t be the one thing that holds you back. Our family has been homeschooling for 2 years and have managed not only to continue to make money but to also make enough to pay off our debts. 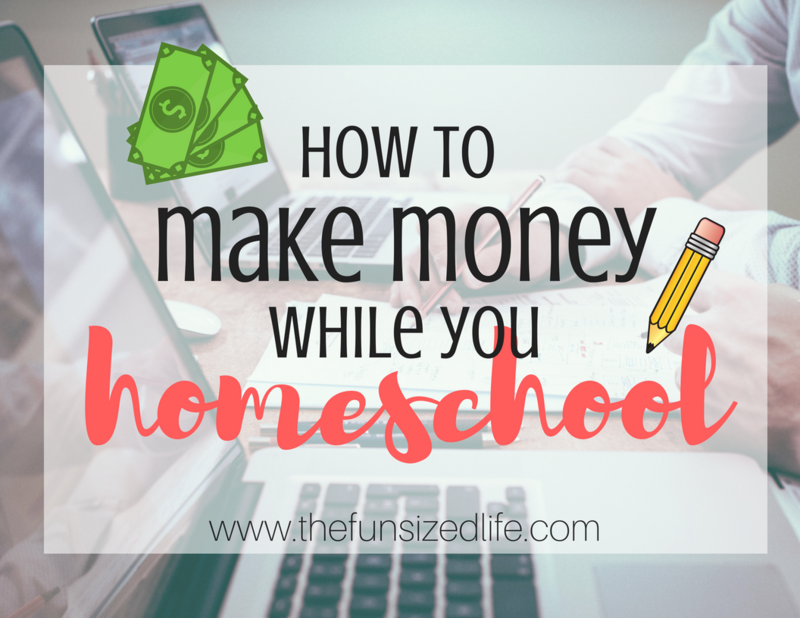 I want to spread the word and share with other families how it’s possible to make money while you homeschool. No one way fits all, of course, so I’ll do my best to cover all the bases! *This post contains affiliate links. I may make a commission on anything I recommend but please know all opinions are my own. Do you want a structured, scheduled homeschool? Do you want a child-lead, Montessori type homeschool? How much funding will you be needing to maintain the home and school life? All of these things will play a factor in the time, money and overall management of your school/work life. So let’s talk options. What different jobs are available to you? What are the perks of each? When it comes to making money outside the home for both parents, this can be a challenge, especially if you have younger children at home. It might be difficult but many families do it every day. Even working full time! Life stays on a schedule — might not be able to take odd holidays like many homeschool families. For our first year of homeschooling, Tom maintained his full time job and I worked a part-time job as a preschool teacher. This often meant he was dropping our kids off at my work while he took off for his. While it was only 2 days a week, it was a struggle trying to maintain communication and for me to juggle home and work life. Making money from home is what many parents turn to whether it is one parent or both. They do this in order to maintain a flexible schedule and help with a steady homeschool routine. When Tom’s work schedule continuously changed, I knew to make money from home was probably my best bet. I had to quit my preschool job, then took a part-time evening job teaching dance and wound up having to quit that one as well. I knew this was the push I needed to jump into blogging full time and I am so thankful for all the problems that pushed me in the right direction. For me personally, working from home has allowed me to make more money and maintain a more peaceful homeschool experience. Start a blog. See how it works here. Resell items. Many families are making a killing at reselling items on AmazonFBA. One wife was able to supplement her husband’s income and they both now work from home. Learn how to get started. Rover – This year we started dog sitting through Rover. It has been perfect for us since we’re home all day and has taught my kids a lot of responsibility. See if Rover is near you! QKids – No degree? You might be in the clear. With QKids you can earn $16-$20 teaching English online and if you have experience with kids, you may qualify! SayABC – Earn up to $21 per hour, set your own hours and teach English online! Apply today. Virtual assistant – Many small businesses and entrepreneurs need help running their business and they need someone to help out on the virtual side. Uber and UberEATS – Work when you want, chill when you want. Uber is perfect for working around a schedule. Stella & Dot – Sell jewelry and accessories from home. Affordable start-up costs and great commissions! Sell subscription boxes – Read all about how to start your own subscription box company. These are of course just a few ideas and these are the ones that allow you the freedom to set your own hours and work around a homeschool schedule. There are of course other work-from-home jobs you can do through bigger companies but may not offer the same flexibility as some of these options. Figuring out a scheduling system. Self-employment may not offer the same benefits or pay as working outside the home. One of the great aspects of homeschooling that I absolutely love is that you can really encourage your child to be who they are. They can grow their natural talents and maybe even learn about entrepreneurship at a young age. Now, I’m not saying you can start making them work for you! As enticing as that may sound! Being a homeschooling parent can mean more financial stress on a family and finding a way to encourage kids to add to their savings at a young age might be beneficial to everyone. Encouraging children to start making money at a young age will not only encourage good work ethic but also gives them the opportunity to appreciate saving part of their wages and learn to manage their money wisely. Modeling – I know, it sounds so “child star,” but doing simple print ads for places like Target or Kohls actually pays really well and can allow your children to build wealth for themselves and all they have to do is smile. Write their own book. Places like Blurb allow you to create your own novels, cookbooks or photo books and purchase in bulk in order to re-sell. A great option for a budding writer. Start a blog. Again, a great idea for an artistic child with a flair for writing. They may very well be making money enough to pay for college! Just make sure to research before leaping into anything! Best FREE blogging courses. Photography. Let them use their passion for photos to make money and start an online portfolio early! Babysitting or nannying. Many mom groups that I’m a part of often request homeschooled high school kids to help babysit or nanny their children because they know they are able to have flexible hours but be less costly than a college student. Tutoring. If your child shows promise in an area, math,Englishh, music…you name it, consider getting them into tutoring. A girl I knew was teaching piano lessons as a second income throughout high school. Web design. There are great sites like WP Engine that would really allow a budding designer to let their web design creativity fly! This would also be a great way to start a portfolio for college! No matter what, homeschooling is going to require some trial and error when it comes to time management. Whether you work from home or work outside the home, figuring out a schedule that works for you will present its challenges. Here are some of my best tips after 2 years of trying to figure out how to manage work from home and work outside the home homeschool schedules. Keep everyone’s sleep schedule in mind. –If you have late risers, getting work done in the morning may be a good option. Organize your curriculum to be quickly and easily accessible. Keep schoolwork digital. See how. Prepare school work the night before. Create a loose schedule at first. -Tweak it where and when you need to. What will craft be each day? What is one work goal you have? If you are a person who thrives on organization, I highly suggest this life planner from Abby Lawson. It will help you keep everything together from work to home! Maybe you can’t fathom the idea of working and homeschooling. I get it. It can be a lot. Maybe you need a little extra spending money and don’t have time to fit in another job into your schedule. Here are some easy ways that I make money while grocery shopping or in my spare time. Rebate apps: learn about all of them and how they work. Survey sites: Survey sites vary in how they pay, but most usually just ask you for your opinion and then pay you when you complete a survey! Doing this a few hours a day is a good way to create an addition $100 or so per month. Pay off debt: I can’t stress enough how much money you could save/make if you can get right with your finances! See how my family and I paid off $6,000 in 6 months! Billionaire Warren Buffett’s 3 Steps to Success.